Marketeers have latched on to this designation as a way of shifting more solar panels, but what does it actually mean? Is a solar panel from a so-called "Tier 1 manufacturer" of higher quality? What is a Tier 1 Solar Panel Manufacturer? Bloomberg New Energy Finance (BNEF) is a research consultancy that provides financial information and analysis to investors in the Clean Energy sector. BNEF tracks large-scale solar farm development projects, their value, the solar panels used and what kind of finance has funded the development. Banks that finance solar farms can do so with either 'recourse' or 'non-recourse' finance. 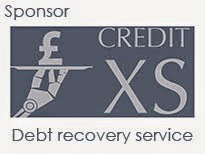 Non-recourse finance means that the bank has no charges over the assets of developer that builds the solar farm, so it will want to be confident that if there's a problem once the farm is handed over it can all be sorted out under the warranty of the solar manufacturer. Consequently banks have a 'whitelist' of solar panel manufacturers that they will accept on projects financed on a non-recourse basis. BNEF realised that its knowledge of development projects allowed it to infer which manufacturers were whitelisted by banks. It developed a classification to create a list of 'major' or 'bankable' solar panel manufacturers and subscribers to its services can access this list to help inform investment decisions. Under the BNEF scheme, a tier 1 manufacturer is defined as one that has sold its own-brand, own-manufacture panels to six projects larger than 1.5MWp (around 6,000 panels) in the past 2 years, where the financing of those projects was by six different banks and the finance was 'non-recourse' finance. To complicate matters further, there are other, competing businesses also offering reports listing tier 1 solar manufacturers based on their own methodologies, for example Navigant Research has released lists in the past. The list is dynamic - companies are leaving and entering the list the whole time. "We have chosen the solar panels we offer based on quality, efficiency and value we only use Tier 1 solar panels." "We use the very best performance-guaranteed, tier 1 products"
"the performance of tier 1 products will always outweigh the quality of their competitors"
"we believe in only using the best, which are the Tier 1 solar panels." A deliberate confusion of panel quality with the tier 1 list has created the impression that 'tier 1 panels' are better. Are they? Is a Tier 1 Solar Panel a Better Solar Panel? "We strongly recommend that module purchasers and banks do not use this list as a measure of quality, but instead consult a technical due diligence firm....the classification is purely a measure of industry acceptance. There have been many examples of quality issues or bankruptcy of Tier 1 manufacturers". So, lets turn to a technical due diligence firm for advice. Fortunately one such company, DNV.GL produces an annual report of its findings and recently published this years - the PV Module Reliability Scorecard Report 2017 . In this document, the accreditation and testing laboratory reports the reliability test results for more than 50 commercially available PV solar panel models, which, according to the company, makes it the most complete publicly-available comparison of PV module reliability. They claim that it covers most of the leading manufacturers active in the market today. The tests are similar to those used in EN61215 type approval testing, comprising thermal cycling, dynamic mechanical load, damp heat, humidity freeze and PID (potential induced degradation). Critically DNV.GL "do not see a direct correlation between the size of the manufacturers and the performance in accelerated testing". 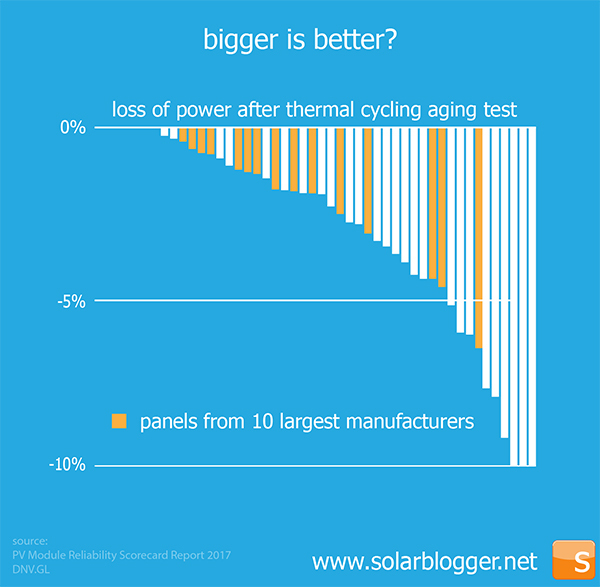 The graph above shows the power loss after panels had endured artificial aging through thermal cycling. The results coloured with the orange bars are products from the top-10 global manufacturers by volume. Some small manufacturers obtained very good results, while some large manufacturers produced panels with poorer performance in this test. So the take home is– Tier 1 is not what it sounds like, and it’s certainly not the guarantee of quality that sales people from some solar companies are presenting to customers. Even in the clean energy sector, marketing gimmicks are used all too frequently to encourage buyers to purchase products without doing proper research. It is wise to always consult a professional before attempting to make such deals, of course, but the correct amount of research will also ensure a safe buy for all.